I am heartily sick to death of ‘green architecture’. And I don’t mean that I’m a little fed up with greenwash or that I am slightly peeved that sustainability doesn’t get the attention it deserves. I mean that sustainability – in itself – has shown itself to be a euphemism for backwardness and I’ve had enough of the reactionary lectures by unelected green spokespersons. ‘Sustainable architecture’ is insidious, it’s patronising and it’s a recipe for uncertainty (what materials to use? where to build? Whether to build?). It’s not just the holier-than-thou attitude of the sustainability industry or the fact that over-paid eco-consultants have as much of ‘an agenda’ as anyone else (but pretend not to); the dangers of sustainability actually go much deeper. I hate sustainability because its relentless focus on the environment is killing creativity and undermining the needs and desires of the modern world. The Brisbane GoMA (Gallery of Modern Art) has a new show starting mid-November. It’s called Optimism and it’s about contemporary Australian artists. I really like the poster, and we should be quite impressed with GoMA’s record this year. First, Andy Warhol, then Picasso’s Collection. Both very popular (Warhol got over 120 000 individual visits) and this shows that GoMA management are thinking hard about what sort of ambitious major exhibitions will bring in a lot of interest from the public. I think this is a very positive way for a big cultural institution to act, and it’s one of the reasons I feel optimistic. There is an online argument brewing about an attack on Australian Defence Force Academy (ADFA) Associate Professor Dr Anthony Burke, among others. The attack on Dr Burke was published in a Quadrant Magazine article, written by Mervyn F. Bendle. Bendle argues that Burke represents the “political Left” who have taken over academic terrorism studies, “with all the anti-democratic, anti-liberal, anti-Western, anti-American, anti-Israel, pro-terrorist, and postmodernist ideological gobbledygook that entails”, and appears to suggest that Dr Burke should not be employed by ADFA. Strange times are becoming interesting. I don’t think I’ll make any wild predictions about the current financial crisis being the precursor of an economic meltdown. I wouldn’t have a clue. Nor can I provide a rigorous and convincing case for the claim that crises are inevitable under capitalism. What I can say is that people like the US Treasury Secretary sure look frazzled and there is no consensus among pundits on whether the $700 billion bail out will do the trick. I went to visit the Sidney Nolan: A New Retrospective exhibition at the Queensland Art Gallery yesterday. I didn’t know much about Nolan except for his famous Ned Kelly paintings. 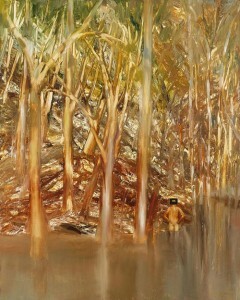 (For non-Australians, Ned Kelly was a famous bushranger (highway robber) who was hanged in the late nineteenth century, and is still an iconic Australian figure today – Nolan’s paintings of him were used as the basis for costumes of some of the dancers in the Sydney 2000 Olympic Games opening ceremony). Of course, seeing the images on screen is unsatisfactory compared to seeing the real thing, but if you’d like to browse some of Nolan’s work you can start here at a Google image search. While I admire Nolan’s technical skill, I kept feeling that much of Nolan’s work – especially after his early period – both represents and re-inforces an Australian cult of failure that is one of the most damaging forces standing against a progressive culture in Australia today. I wish I had a dollar for every time I’ve seen factually false claims made in the mainstream media about the oil situation in Iraq. A lot of the mythology is being created with a view to justifying the discredited analysis that saw the US motivation for the war in terms of oil. More than five years on since the overthrow of the fascist dictatorship of Saddam Hussein, a democratically elected federal government has so far failed to have a draft national oil law passed by parliament and, in light of the increases in the price of oil on the world market of a couple of mnoths ago, the Iraqi government decided to offer short term no-bid service contracts to Exxon Mobil, Chevron, Shell, Total, BP and a consortium of smaller companies with a view to boosting production. These technical service agreements were to be undertaken on a fee (rather than product share) basis but the Iraqi government has recently decided not to proceed with them, and the targetted increases in production cannot now be met. 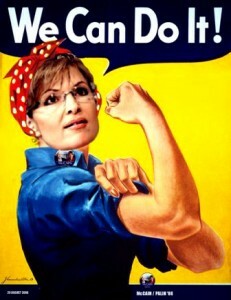 Real or not – this is the sort of image projected by Palin. I’m glad it appeals. Sarah Palin produced a stunning performance when she spoke at the Republican Convention yesterday. She scared the pants off the pseudo-lefty blogospehere. When put to the test, McCain’s “idiotic” and “uniformed” choice of running mate revealed herself to be more than a “confused fundie airhead”. Turns out he knew what he was doing. It’s panic all around. Maybe the End really is nigh! Could The Messiah be running out of luck? Check the sustained cheering and mayhem when she goes “the media”. It’s decent small town repubs agin dirty left liberal media blogging fops. I never seen such a big snook cocked. If she manages to transcends the base – and allows the mainstream white voter to find reason to honour their instincts – then the Dems are done again. If Obama needed a challenge – he’s got it now. I’d love to think that coming back to the issues is the answer but I reckon this is gonna be all about rhetoric. Voters are uncomplicated folk by and large and economics may as well be string theory. Oh dear!! What a pity those “uncomplicated folk” have the vote!